There is a bullish momentum pattern in Atlassian Corporation PLC (NASDAQ:TEAM) stock 3 trading days before earnings. Further, we use moving averages as a safety valve to try to avoid opening a bullish position while a stock is in a technical break down, like the fourth quarter of 2018. According to our data provider, Wall Street Horizon, TEAM has a confirmed earnings date on 2019-01-17, after the market closes, and three trading before then would be Monday, 1-14-2019, near the end of the close of trading. The logic behind the option trading backtest is easy to understand -- in an any market there can be a stock rise ahead of earnings on optimism, or upward momentum, that sets in just 3-trading days before an earnings date. That phenomenon has been well documented by Capital market Laboratories in our seminal webinar on market patterns. We will examine the outcome of getting long a weekly call option in Atlassian Corporation PLC 3-days before earnings (using trading days) and selling the call before the earnings announcement if and only if the stock price is above the 50-day simple moving average. As of this writing, 1-12-2019, TEAM is well above its 50-day moving average (DMA) (see the image below), so unless there is a massive draw down on Monday 1-14-2019, this back-test should trigger at the end of the day on Monday. From the pivot point chart -- a chart made for traders, available on this very site you are on (www.CMLviz.com), we have the clearest view possible of where the moving averages line up relative to each other, and in this case for TEAM, specifically, where the 50 DMA lines up relative to the stock price. ➡ The average percent return per trade was 49.1% for each four 4-day period. You can check to see if the 50-day MA for TEAM is above or below the current stock price by using the Pivot Points tab on www.CMLviz.com. We're now looking at 83% returns, on 3 winning trades and 0 losing trades. ➡ The average percent return over the last year per trade was 35%. 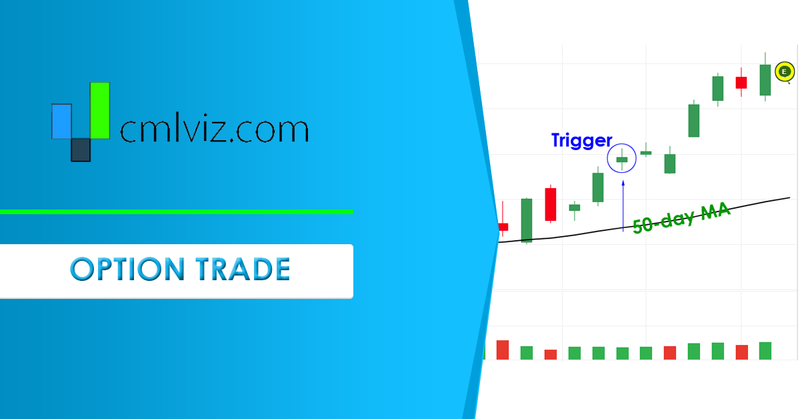 Trade Machine gives you the capacity to trade beyond luck, with stock or options, with and without technical triggers.